I recently came across WebMeUp.com while searching for new ways to track down dodgy backlinks following a Google Penguin penalty. I had already used Google Webmaster Tools but felt that I needed something easier to run a report in that also provided sortable data via the report rather than having to download into a spreadsheet and juggle the results around myself. Unlike some of the other backlink analysis tools, WebMeUp gives away a lot of information for free. When you first sign up you get, I think, full access for free, then after a couple of weeks it will go back to basic. For pure back link checks it is all free though. Although that may change in the future after I have written this. The paid options allow you to do much more, but for the average person who just wants to check for bad links to add to the Google Disavow list, this works great. Let’s take a look. The homepage is minimal with a large box to add a domain for checking. I entered Webologist and hit enter. It starts checking, giving a little progress graphic along the way. Once the report is ready a video appears that explains how WebMeUp works. You can skip the video if you like. You are asked to register for an account, or connect with Facebook, when you get started. The project page shows the domain you entered earlier and gives some data, such as Domain Strength, Google PR, Alexa Rank, Visibility, Pages in Google and the total number of backlinks. As mentioned I first used this tool specifically to look at backlink data, so I will talk about that first before I run through some of the other interesting tools. I should point out that I think many of the additional tools are premium services, but let’s see. There are around 40 pieces of information for each link, there is a huge amount of data. The summary page allows you to sort the backlinks by page, title of page, nofollow/follow, anchor text, anchor URL, page strength (not sure how this is calculated), Google PR for the page, Google PR for the domain, Alexa Rank, age, country and IP address. Penguin tip: I sorted by IP address to chase down link farms which are probably causing a problem and also by anchor text to find bad links using optimised anchor text. Found a lot of additional links using these methods. Viewing backlinks by domain is helpful too as you can quickly spot when one domain seems to be excessively linking. While looking at Webologist I spotted that I have 21 links from a website called marijuana-movies.com. All the pages with a link on are listed. The website is no longer active so I cannot see what was linking – probably a good thing though! However, this does mean that the link information is a little out of date – but then so is backlink information in Google Webmaster Tools and services such as MajesticSEO and Link Detox. The report brought up one of my better recent links is from Managewp.org where some members linked up the recent post I wrote about Testing the Google Publisher Plugin for WordPress. I had no idea other people had picked up on this post and started linking to it – cool. In fact, I had never heard of ManageWP either, looks pretty handy. Maybe Webologist will become more popular one day after all! Ordering links by PageRank is handy – a quick scan of the zero pagerank links brings up some sites I really should disavow! When you connect your Google Analytics it will show you which backlinks are bring the most traffic to the site – this is real reason to get backlinks, they send referral traffic which can be more important than winning top search engine positions. You can configure the settings easily, add more sites, turn off search engines and analyse social too. You can add your most important keywords to WebMeUp and it will track where they are appearing in various search engines for specific searches. WebMeUp analyses not only Google web search but also image, shopping, videos and places. You can add your competitors too to keep an eye on what they are doing. I have not yet delved too deeply into the additional features which require you to add your own data, but they do look like they could be useful. The data is added manually, it is really simple. For keywords you can simply download the Search Traffic > Search Queries data from Google Webmaster tools. To test I just took the top 100 keyword phrases from WMT and pasted into WeMeUp. It took seconds for it to upload and within a couple of minutes the new information had been processed. You need to then connect with Google Analytics. If you have multiple accounts in Analytics this is not a problem, just click the one you need to connect to the WebMeUp project. 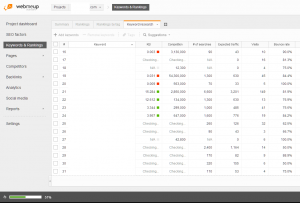 Once keywords are added and WebMeUp is linked with your Google Analytics accounts there is a whole new stack of data to study. For each keyword you can see how many visits there have been. In the Rankings section there is a breakdown by search engine with additional data such as bounce rate. The most important piece of information for many will be the Google rank – where it is now in the Google search engine. For each keyword phrase you can assign a tag to allow reports to be rather more quickly in the future. A slight annoyance with WebMeUp is that it does seem to take a long time to check – on the Keyword and Rankings pages the page was on “Checking” for a long time. There is a green progress bar though, so at least you do know that it is still working. This is a good time to make a cup of tea ….. This statistic caught my eye – WebMeUp provides a rating for how efficient a particular keyword is. The term has certainly been around a long time. It is a way to identify keywords with less competition that will still deliver some traffic. Many people make the mistake of targeting the most popular keywords and fail to realise (at first) that they cannot compete with the 1000 websites that are already ahead of them. But by focussing on lesser keywords you can make ground and get some valuable traffic. Of course, you do need to have some pages and keyword data before you can assess your progress. There is a lot of information on on-page features too – it is not all about backlinks. The on-page features provide advice on improving titles and also alerts to problems in the code that may be negatively impacting your website. I have always been a big fan of on-page SEO, in fact I only really started looking at backlinks after finding myself with a Penguin penalty! The Page information is ace. The summary pages gives info on pages indexed in Google, load time, Google PR distribution (are important pages buried and receiving little PR? ), HTTP response codes, errors and warnings. Errors include 404 pages and pages with duplicate titles. This is quickly updated, I deleted a page this morning and it is already reported as a 404 – I am still linking to the deleted page somewhere on the site – and it tells me where. Great! Duplicate page titles is something I need to look at for Webologist – I have some tags and categories with the same name. Rule No.1 of running a WordPress site should be to never have cats and tags with the same name! Warnings include pages with Flash, frames and “Heavy” pages. Also if URLs are considered too long (not sure how bad that really is). Pages with many outgoing links, or more important, pages with broken links are also reported. On-page warnings include long titles, empty meta descriptions (they good for increasing CTR in search, so are important for SEO) and metas that are too long. The Info section gives details of indexing and crawlability, redirects and encoding / technical issues. For each section there are some SEO recommendations, for example under the indexing and crawlability section it shows “Pages restricted from indexing” – if indexing is blocked with robots.txt or meta name=”robots” content=”noindex” in the header of the site, affected pages are listed. Once you have your keywords, competitors and Analytics in the tool it seems to do a good job of keeping track of what is going on. 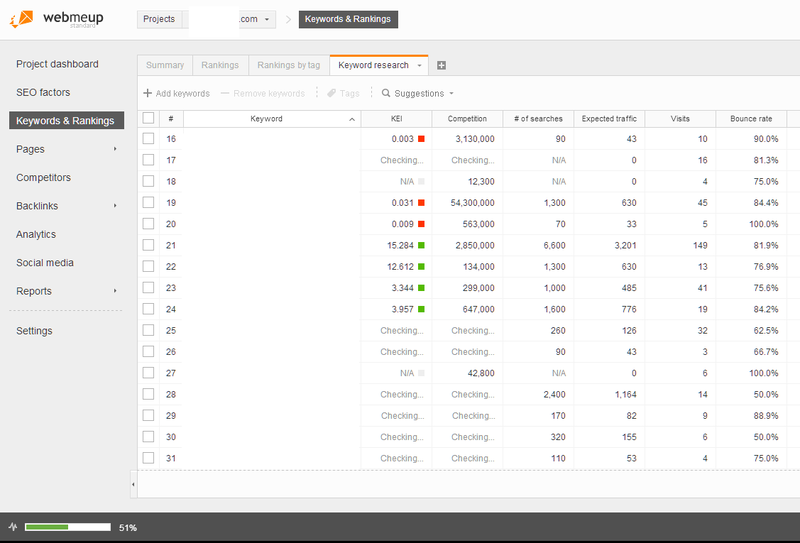 For the top 100 keywords it reports in a leader board style for Ranking Success on the dashboard, detailing how many keywords are still number 1, how many in top 10, top 20 and top 100, and also changes. I do not have change data yet, too soon to tell at the moment. WebMeUp also monitors some social networking and bookmarking websites; Facebook, Twitter, Google Plus, Delicious, StumbleUpon and Diigo. LinkedIn and Pinterest are notable omissions. WebMeUp are still developing their tools. While writing this blog post I had an email from them inviting me to look at their new traffic stats. The “not provided” solution you’ve been waiting for so long has been finally released — meet the “Approximated traffic” feature in WebMeUp! Ever since Google stopped providing keyword search referral data SEOs have been a little confused about how people get to the websites that they manage. WebMeUp say that they have a solution. I am certainly not familiar with many SEO packages but having used a few, mostly for backlink anaylsis over the past year, I do like WebMeUp. The fact that they provide a lot for free (to start with) is good. But then, MajesticSEO and Google Webmaster Tools is also free for your own sites. I have not used WebMeUp to spy on competitors yet – but it is probably worth a look for that too! 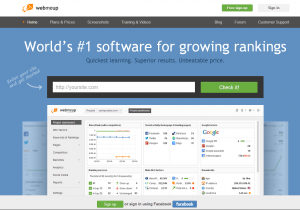 WebMeUp.com is definitely worth adding to your list of SEO tools.